President Barack Obama hosts the Medal of Honor Ceremony for retired U.S. Army Capt. Florent Groberg at the White House in Washington D.C., Nov. 12, 2015. Capt. Groberg received the medal for actions during a combat engagement in Kunar province, Afghanistan, Aug. 8, 2012 while he was the commander of a personal security detail for the 4th Brigade Combat Team, 4th Infantry Division, when he and another soldier, Sgt. Andrew Mahoney, identified and tackled a suicide bomber, saving the lives of the brigade commander and several others. On Nov. 12, medically-retired Capt. 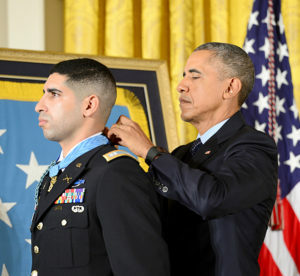 Florent A. Groberg became the 10th living service member to receive the Medal of Honor for selfless actions on the battlefield in Iraq or Afghanistan. Obama told Groberg’s story of how the French-born former Soldier came to America and became a naturalized citizen in 2001, the same year he graduated high school in Maryland. He next attended the University of Maryland competing in track and cross-country before graduating and receiving his commission in the Army in 2008. As the formation approached the provincial governor’s compound, Groberg noticed off to his left a man dressed in dark clothing, walking backward, some 10 feet away. The man spun around and turned toward the captain who simultaneously sprinted toward him and began pushing him backward and farther from his detail. As he pushed him away, Groberg noticed a bomb under the man’s clothing. What Groberg didn’t know was at the time the suicide bomber blew up, a second suicide bomber released his bomb killing four others outside the perimeter. “That blast by the bridge claimed four heroes Flo wants us to remember today,” Obama said. “One of his mentors, a 24-year Army vet who always found time for Flo and any other Soldier who wanted to talk — Command Sgt. 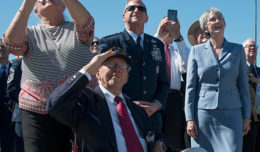 Maj. Kevin Griffin; a West Pointer, who loved hockey and became a role model to cadets and troops because he always cared more about other people than himself — Maj. Tom Kennedy; a popular Air Force leader known for smiling with his whole face, someone who always seemed to run into a friend wherever he went – Maj. David Gray; and, finally, a USAID [U.S. Agency for International Development] foreign service officer who had just volunteered for a second tour in Afghanistan, a man who moved to the United States from Egypt and reveled in everything American, whether it was Disneyland or chain restaurants or roadside pie – Ragaei Abdelfatah. “These four men believed in America… they dedicated their lives to our country… they died serving it,” Obama said. “He’s not running, but he’s doing a lot of CrossFit — I would not challenge him to CrossFit,” Obama joked. “He’s putting some hurt on some rowing machines and some stair climbers … I think it is fair to say he is fit. “Today, Flo is medically retired, but like so many of his fellow veterans of our 9/11 generation, Flo continues to serve,” Obama continued. “They are incredibly highly-skilled, dynamic leaders always looking to write that next chapter of service to America. For Flo, that means a civilian job with the Department of Defense to help take care of our troops and keep our military strong.